See How Much Life Insurance Do You Need? 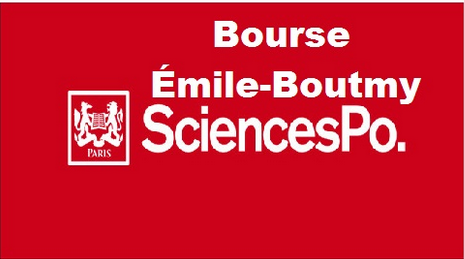 Applications are invited from suitably qualified candidates for the Sciences Po Emile-Boutmy Scholarships for Undergraduate and Master’s programmes for the 2019/2020 academic year. The deadline for submission of applications is April 8, 2019. Sciences Po created the Emile-Boutmy scholarship, named after the founder of Sciences Po (1871), in order to welcome the very best international students from outside the European Union. The Emile Boutmy Scholarship is awarded to top students whose profiles match the admissions priorities of Sciences Po and individual course requirements. Sciences Po Emile-Boutmy Scholarships Requirements. The Emile-Boutmy scholarship may not be combined with other scholarship (Eiffel scholarship, AEFE scholarship, BGF…). This scholarship is awarded based on merit and according to the type of profile sought for this programme. Social criteria are also taken into account. This scholarship is not automatically awarded: candidates must indicate their wish to apply directly in their online bachelor or master’s application form. Sciences Po Emile-Boutmy Scholarship Eligibility. Must have been admitted to the Undergraduate or Master’s programme. How to Apply for Sciences Po Emile-Boutmy Scholarship. Students must indicate that they are applying for the Emile-Boutmy scholarship in the “Financial information” section of their Sciences Po application. Students will also be required to include proof of income and documents explaining their family situation (e.g. income tax return for both parents, payslips, divorce certificate, unemployment benefits, documents related to alimony, child support or retirement pensions, death certificate…). Applicants must also attach, if applicable, their language test before the application deadline of the scholarship. The Admissions Department is responsible for awarding Emile-Boutmy scholarships. Please note that your scholarship request will only be taken into account if you are admitted to one of our eligible programmes.